Thank you to everyone involved in CincyInk, The Cincinnati Tattoo Project and Ink Your Love. ArtWorks is so appreciative of your dedication to Cincinnati and everything you did to help make this project come to fruition! Learn more about CincyInk using the navigation buttons below. Crowd-sourced letters, stories, written expressions of love for Cincinnati collected. Poem is revealed, tattoos are assigned and inked. ArtWorks CincyInk was an interactive, citywide celebration of love for Cincinnati, manifesting itself in the form of poems, tattoos and urban art installations. It was a declaration of love to our Queen City. It was a poem and a project of ArtWorks that was about love, words and permanence. Inspired by the Cincinnati Tattoo Project, and the vision of artists Kurt Gohde and Kremena Todorova, CincyInk was, at its core, an exaltation of love for the city of Cincinnati. The words of love that make up CincyInk were directly sourced from the beautiful voices of over 1,000 participants and compiled into the poem Seven Hills and a Queen to Name Them by the writers at Chase Public. These words were inked, line by line, onto the walls and skin of those who call Cincinnati home. It all began with a call for letters, stories, tweets and other written expressions of love for Cincinnati from everyone who calls it home. Over 1,000 declarations of love were submitted by participants and fashioned into a love poem by poetry commission, Chase Public, to the city called Seven Hills and a Queen to Name Them, which beautifully captured the sentiment of residents both within and outside the city’s limits. After Kurt & Kremena divided the poem into 263 single words and phrases, and designed each of them as a unique tattoo, the talented team at One Shot Tattoo permanently inked this symbolic expression of love for the Queen City on the wrists, calves and ribs of more than 250 Cincinnatians. Along with community partners, artists and sponsors, we brought CincyInk to life all across the Queen City (download map). We rallied behind the hashtag #inkyourlove to anchor the project and connect the dots between the poem, tattoos and larger-than-life urban art installations across the city. Found on building facades and skyways, projected onto plazas, and wrapped around Great American Ballpark and all over the bars and restaurants up and down Vine Street, Main Street and everywhere in between. We timed the launch of the public art installations with the MLB All-Star baseball game to show our civic pride to the world and introduce our city’s commitment to art and creativity. It was a sure “wow” for our out-of-town guests and immersed them in our love for Cincinnati. The ArtWorks CincyInk project is for anyone and everyone who calls Cincinnati home. Visitors and residents alike were able to discover CincyInk’s lines of love across downtown and OTR through tours of the CincyInk urban art installations. Poem commissioned by ArtWorks, underwritten by The Johnson Foundation, and crafted by Chase Public. The Cincinnati Tattoo Project is a key part of CincyInk, a city-wide celebration of love for the Queen City! This artistic endeavor connects the words of the poem personally and permanently to over 250 individuals who call Cincinnati home. Each participant in the Cincinnati Tattoo Project has received a unique tattoo of words from the poem on their bodies. 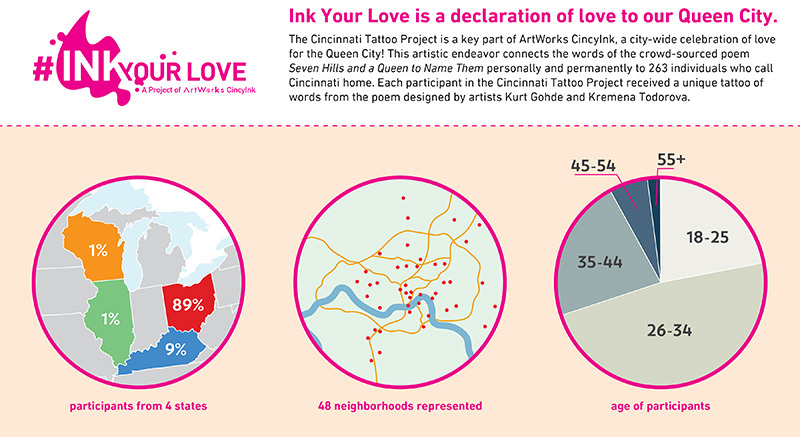 263 unique phrases have been designed by artists Kurt Gohde and Kremena Todorova, and assigned to the 263 individuals eager to permanently ink their love for Cincinnati. Kurt Gohde & Kremena Todorova, the artists behind successful community-wide celebrated the Lexington Tattoo Project and the Boulder Tattoo Project, are the same artists that ArtWorks commissioned to bring their idea to Cincinnati. Godhe & Todorova have designed all of the 263 tattoos, which will only be produced a single time for each tattoo recipient in the project – ensuring that all participants receive an original work of art connecting them to the City of Cincinnnati, as well as the other 262 project participants. Gohde & Todorova worked in partnership with local tattoo artists, One Shot Tattoo, to bring their vision to life. Led by owner and artist Jason Morgan, One Shot Shot Tattoo’s three artists tattooed all 263 recipients with their curated tattoos over a two month period. Morgan, a seasoned tattoo artist of 20 years has completed over 20,000 tattoos prior to joining the efforts of the Cincinnati Tattoo Project. All three artists apprenticed under professional tattoo artists to learn their craft including health guidelines, best practices and how to create a work of art that will age well. The Cincinnati Enquirer generously photographed all 263 participants in the Cincinnati Tattoo Project. These images were used by artists Gohde and Todorova to complete another portion of their project – the final Cincinnati Tattoo Project video. Watch the trailer here. Interested in purchasing a mini mural designed by one of these artists? Click here to check out what we have. Ink Your Love was a declaration of love to our Queen City. It was a poem and a project of ArtWorks CincyInk. It was about love, and words, and permanence. It was crowd-sourced, then written, then inked, line by line, on the walls and skin of those who call Cincinnati home. People were encouraged to discover lines of love that were inscribed across downtown Cincinnati and Over-the-Rhine from September- November 2015. For any press inquiries, contact Destinee Thomas at 513-333-3613.